Transient voltages and surges are a major cause of equipment failure and system disruption. The TDS50 series of surge protective devices, part of the ERITECH® line of facility electrical protection products from ERICO, is designed to help provide economical and reliable protection from voltage transients on solar PV systems. The series consists of three models specifically designed for the solar market: 300 Vdc, 600 Vdc and 1,000 Vdc. 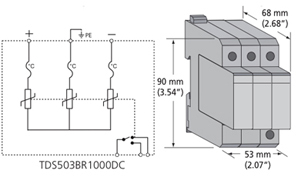 Each model is conveniently packaged for easy installation on 35 mm DIN rail. They feature internal thermal disconnect devices to help ensure the suppressors do not overheat and cause system failure or damage. A visual indicator flag clearly indicates when the disconnect device has operated and the surge module is no longer functioning. The devices also utilize UL® 1449 Ed. 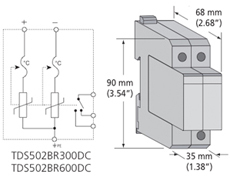 3-recognized replaceable modules, which are compliant to IEC 61643-1. As standard, the TDS50 series provides a set of voltage-free contacts for remote signaling that maintenance is required. The convenient plug-in module and separate base design allow quick and easy replacement of a failed surge module without needing to undo installation wiring. For added convenience, the SPDs have a compact design that allows them to fit easily into inverters and solar combiner boxes. Designed to protect equipment and solar PV systems from damage caused by transient voltages and surges.